I was at a wedding last night and in the middle of the dessert my father in law asked how much I was going to run the next day to burn all this off. If I have said it once I have said it a thousand times. To lose weight or to stay thin you can’t rely on exercise. The answer is diet alone. Exercise is great for your heart and great for your muscle tone and great for strengthening ligaments and bones. But weight loss is about what you eat. If you have watched shows like “The Biggest Loser” on NBC you would think that these people just burn those calories off by working out. They do reach a higher “burn” than most people could because they are on the show full time and not leading a normal life with work and family obligations. However, what the show doesn’t show is what the contestants are eating. I am sure that is a major focus of the show but it’s not exactly made for television entertainment to watch people eat their 1700 calories a day. I did run today. I ran 6.25 miles. The run which lasted 53 minutes and 21 seconds caused me to burn 893 calories. Any self respecting Italian wedding will take you over 900 calories easily. So what does this tell us? Either most people need to start running 15 plus miles on a daily basis or that the food is key to weight loss. I always tell my clients to focus on the food and after they get to their desired weight they can begin to focus on shaping their bodies with exercise. Lucky for me I am at a good weight and I can afford a cheat day. But, if you’re trying to lose weight then remember you can’t just burn it off in the morning. Everything you put in your body counts including drinks. But that’s a story for another day. Being a teacher has many benefits. One of the biggest is the vacation time. This past week was our spring break. The weather has been beautiful here in New Jersey. Spring has definitely started early and it even looks like summer isn’t far behind. Lots of people are going to start a last ditch effort to lose some weight in the next few months before the summer hits. For those people I want to share my spring break as an example of how to lose weight and also what not to do. Wednesday – Spin class for 1 hour. Lifted abs and arms for 1 hour. Sunday – Ran 5 miles fartlek. According to my Nike Fuel I burned 14, 781 calories from April 9th to April 15th. In comparison the previous week I burned 13,620 calories. I was more active in my week off than I was in my “typical” week. So how did I gain 4 pounds? If you follow my blog you know how I talk about how important diet is. I am sure not many people workout like I do. I have the luxury of being a physical education teacher and a personal trainer. I have easy access to gyms at all times. In a typical week I am pretty busy and go right from school to the gym to working out. I often don’t get home or sit down until 8 p.m. On spring break I was home more often. Sitting around the house leads to boredom snacking. I definitely indulged a little more than I normally do. The excess calories led to 4 pounds and it doesn’t matter how many weights I lifted or how many miles I ran. Anytime you see or read something saying that lifting a certain way or doing this workout will result in weight loss I am here to tell you that will never happen. I am living proof. Not just for my ten days of spring break but for years. When I was 285 pounds I went to the gym 6 days a week without question or without excuses. I didn’t run like I do now because my 285 pound frame couldn’t support running. That would be an injury waiting to happen. I was however, very strong. I could bench press 345 pounds but I was very overweight. If you want to get toned, see your abs, lose weight, get ripped, get shredded and or any of these things you need to get your diet in order. Doing ab exercises all day long by the thousands will not help you see your abs any better. It will strengthen your ab muscles but unless you have a low percentage of body fat you not see them because of the layer of fat above the muscles. So, if you want to lose weight for summer focus on your diet first and foremost. Then once you reach your target weight try to build muscle. Now go eat some lean protein and I have to try and lose those 4 pounds. Maybe the most common question I get about my weight loss and healthy living is “what do you eat”? This post is not going to be a long winded article explaining why I choose certain foods but just a list of things I eat. Let me start by saying that I try stay under 2200 calories a day during the week and I go above that on the weekends.I also am very active. Basically I eat what I like. I don’t force down foods that I don’t enjoy. I just try to find healthier options that I do like. Saturday is usually a cheat day where I can eat whatever I want. Then on Sundays I usually eat light until dinner time. Of course this all depends on what the scale says on Saturday morning. I use a website and a phone app called Fatsecret where I record my food and exercise. I also “weigh in” every week and it graphs your weight over time so I can see how it has changed with my diet and exercise habits. If I am at a certain weight then I can feel ok about my cheat days and if not I just make adjustments. The other things that I concentrate on is getting at least 150 grams of protein a day. That being said here the things I eat in no particular order. Amy’s frozen meals. Enchiladas with Spanish Rice and Beans. I eat the same thing over and and over until I get sick of it and then I will usually switch one of these things out for another but these are my staples of my “non cheats days” As you can see I don’t think fat is the enemy. I think Sugar and Bad carbs are the enemy. If you don’t know a lot about nutrition I would suggest taking a look at Men’s health “Eat This Not That”. I would also suggest keeping track of your diet and you begin to learn what groups things go into and also how many calories you are actually eating. 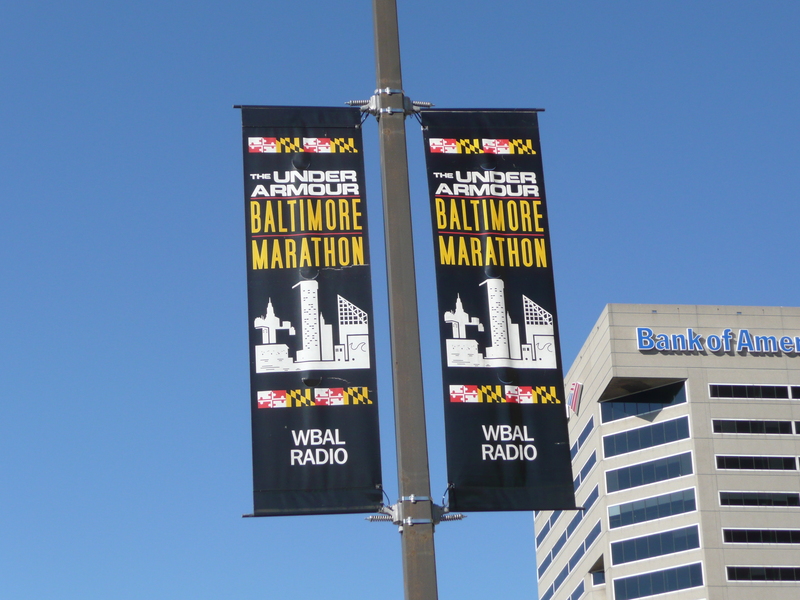 25,000 runners came to Baltimore to compete in the Under Armor Running Festival. My wife Ann and I pose for a picture neat the starting line. Where do I begin? 10 years ago I was finished with my athletic career. Due to a torn ligament in my elbow my baseball playing career had ended. I lifted weights but I was no longer competitive. I was really strong but I had poor diet habits. It took nearly 6 years as I continued to gain weight. 4 years ago I was 100 pounds heavier than I was in this picture. I always tell people that I did not lose weight because of running. I started running because I lost weight. It started with just a mile on the treadmill. Then a year later I signed up for a half marathon in Jersey City. Now three years after I started running I ran my first Marathon. The weekend started with the long drive down to Baltimore. We hit some miserable traffic and it took close to five hours. 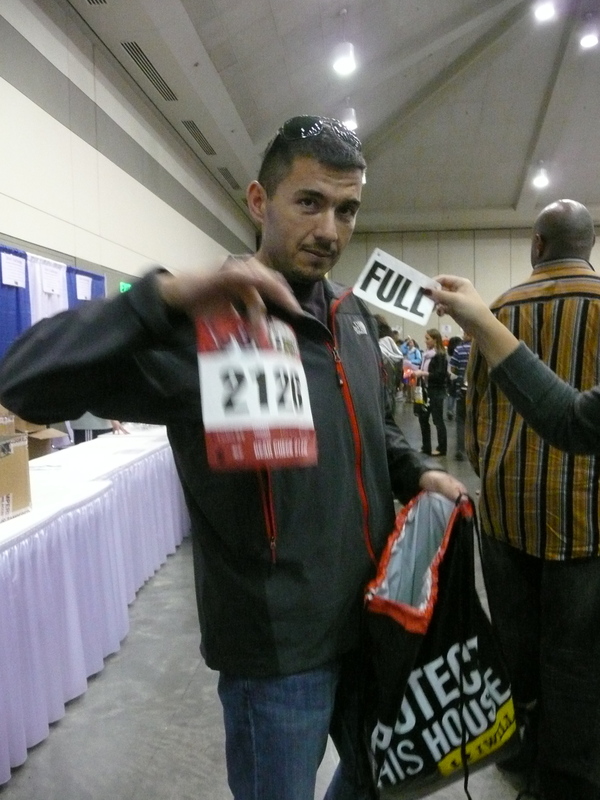 I was not too happy picking up my race bib above. The expo was at the convention center. It was pretty cool. There was a ton of running gear which I browsed through. The only thing I actually picked up were a few gu energy gels that came in handy during the race. I had originally planned to carry 4. However, I decided to bring 6 just in case and I am glad I made that last minute switch. Race morning I woke up at 6 a.m. Alarm worked great (Thank you IPhone) although I am not sure if I really even needed one. I stuck with my plan of not eating before the race. I had a cup of coffee and plenty of water. I followed through just as I had planned it in my mind. I bundled up to face the cold weather and headed down towards Camden Yards. The hotel was just a block away which was perfect. I tried to stay warm. I had a long sleeve tight fitting north face, gloves that came in my gift bag, and a nice winter hat to keep my hands and head warm. I wore my typical Road ID tag and my Nike plus wrist band. I wore under armor shorts and t shirt which I love running in because of their ability to keep dry. I wore my Brooks ghost 4 running shoes. When the confetti dropped and the gun sounded I started gingerly into my run. as I crossed the starting line I hit the button on my Nike sensor and waved goodbye to my family. I knew Miles 1-4 would be up hill from the elevation charts but to be honest it was a breeze. At that point I was fresh and still energized from the crowd and the race atmosphere. Great, I have to pee really badly. I saw a porta potty but there was a line. This is a race! I am not waiting in line to go to the bathroom. Plus at this point I was recalling what I said to my friends at work. I will not walk. If I walk I might as well stop. They though I should walk through the aid stations or at a few strategic points to conserve energy. I disagreed. Just before the race I read Dolphin Dan’s tweet. 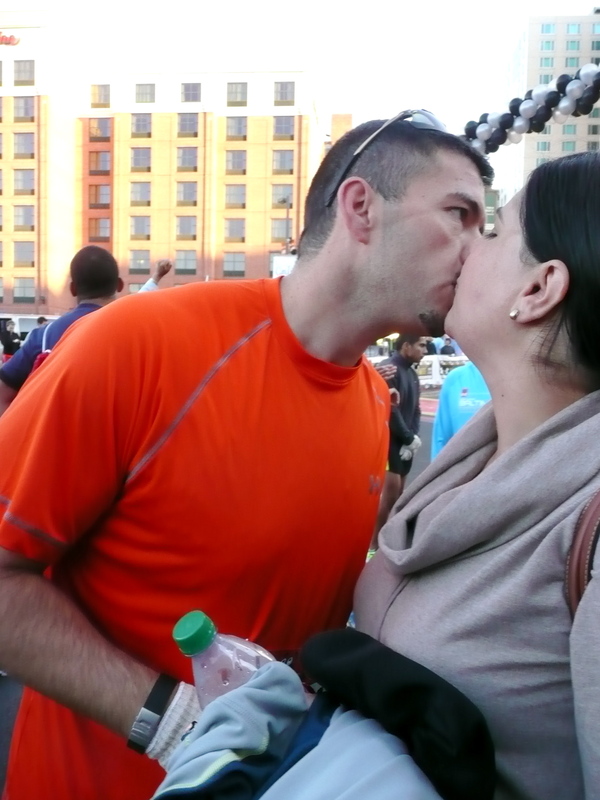 “Good luck to JoeLopez55 in the Baltimore Marathon today. #nowalking. I kept that promise at mile 3.5 or so I saw guys and girls using some well positioned trees. I ran off the road and used the trees and ran back onto course. It might have cost me 30 seconds or so but I didn’t walk and I felt much better. As we approached the Maryland zoo I was cruising. There was a downhill section that I felt like I was just flying through. I guess there were animals and stuff but I wasn’t really paying attention. I think I saw a penguin in a cage but I am not too sure. There were plenty of water stations along the route and I had my gu energy gels which I planned to take one every 4 miles. I stuck with water only. I didn’t want to do anything different than on my training runs. The crowds were great. There were sections of local schools handing out swedish fish and cheering for the runners. There were very few spots where it was quiet. Several people held signs and others stuck their hands out to high five. Even the cops offered their support. 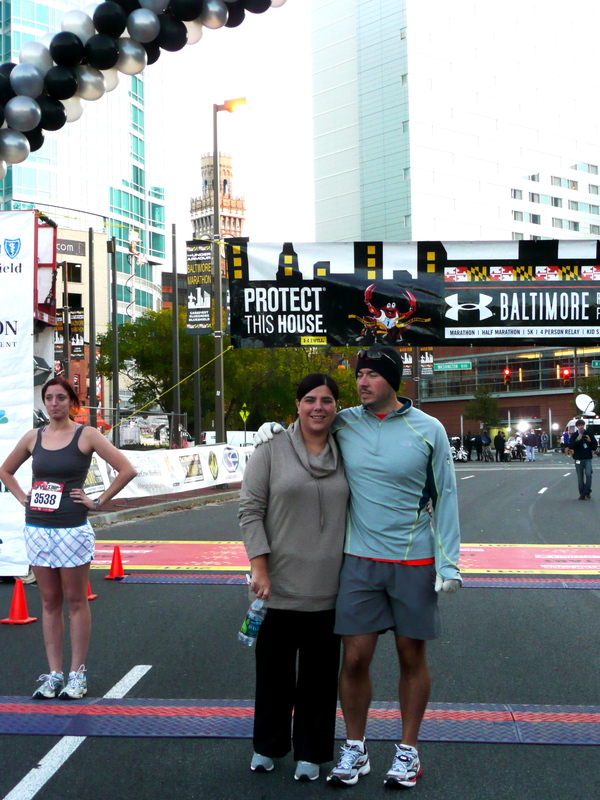 Before I knew it was at mile 9 back near the inner harbor and looking for my family. The way the course was set up we decided they could see me at mile 9 and again at mile 13 both near the same location. I had a feeling that I might have missed them AT mile 9 but I kept looking. It was hard because there were big crowds at these points. I ran that first 9 faster than I told them I would. I guess I didn’t anticipate the perfect weather and the quickness that I ran the hills of 1-4. At Mile 11 we go to the Under Armor Headquarters. It was a non de-script set of brick buildings with a huge sign telling you that you were there. They were promoting their newest running shoe. If we didn’t hit traffic on the way down I was planning on going to the Under Armor Block party where they were giving away free stuff for trying out the sneakers. I wear almost everything else Under Armor but I have always worn Brooks running shoes. There was a guy on the bullhorn encouraging runners and talking about how good we all looked in our Under Armor gear. They also had music blasting throughout the Under Armor Campus. 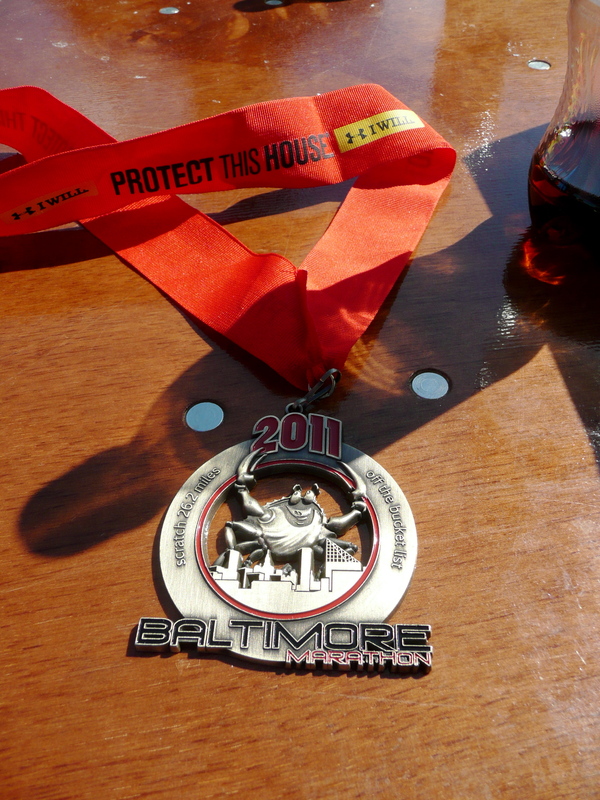 When we made the turn back towards the inner harbor I knew I would see my family at mile 13 because they should have gotten a text when I crossed mile 9 because of the chip tracker I was wearing in my bib. I felt great. The first 13.1 I clocked at 1:56. 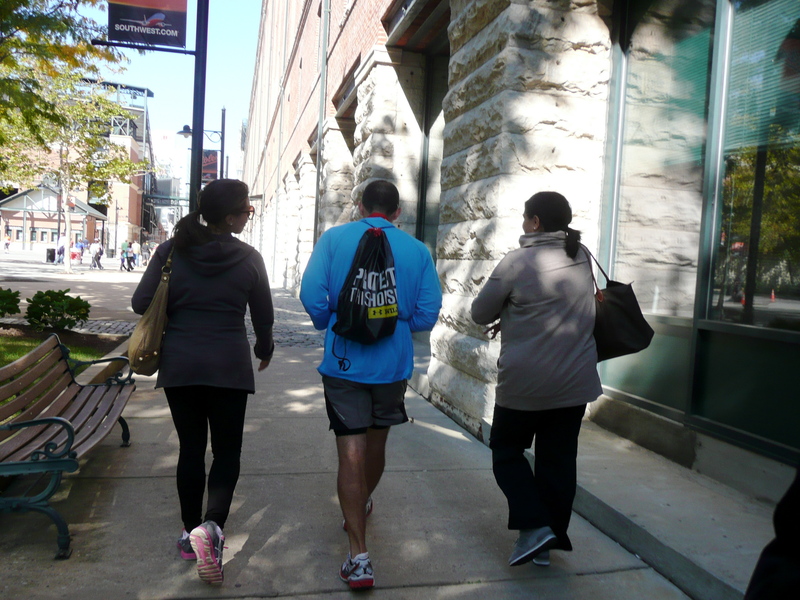 I saw my family and it was a good feeling to see them along the route. I also got there just in time to see the start of the Half Marathon. This is always a cool site because the Half has a lot more runners than the full. Somewhere near 12,000 runners were starting just as I passed by. The merge was a little slow. Last year I was a half marathoner and I thought it was no problem but I guess seeing it from the other side was a little different. After doing 13 plus miles you don’t want to bob and weave to pass slower moving people but I guess it makes for the atmosphere of the race. From this point on it was definitely a lot more crowded. 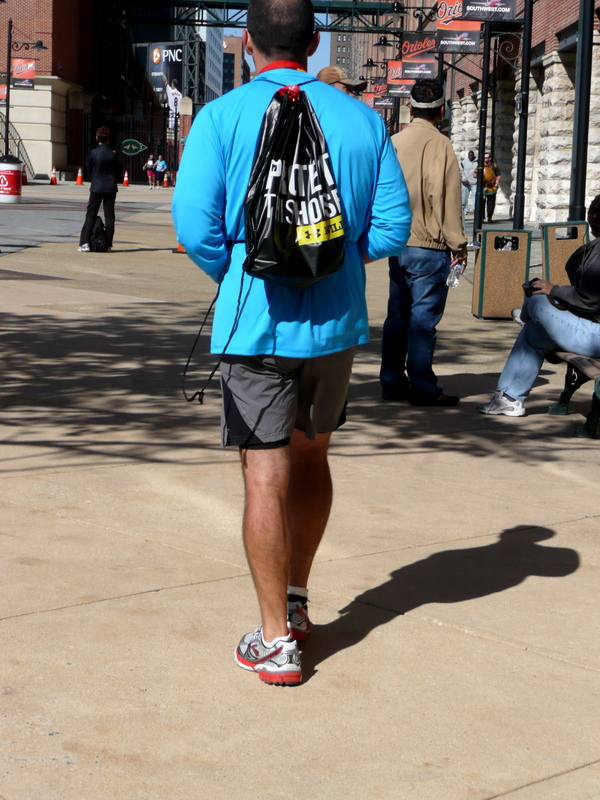 I did enjoy passing half marathoners at the end of the race and then having them see the words “full” on my back. I know that would bother me if I was running a half. I was preparing for my 15-21 from the beginning. I ran hill repeats all summer with the Lifetime Running Club. However, I do have to say making miles 15-21 on a marathon all uphill is just cruel. I actually ran these miles quite well keeping my pace. I was determined not to let that hill beat me. However, Mile 22 I just was worn out. I slowed to a 12:38 pace for this Mile. The hill got to me. That one Mile was the only outlier in the entire race. I am still bothered by that one mile. What if I stayed on pace the whole time? In fact here are my splits. After that it was just few more miles to go. I took two miles to recover and then for the the last 3 miles I returned to my normal pace. When I saw Camden Yards I knew we were close. In that last stretch you run through the area behind the ballpark between the stands and the warehouse. The sides are filled with people. I heard Ann screaming my name. “You’re doing great! 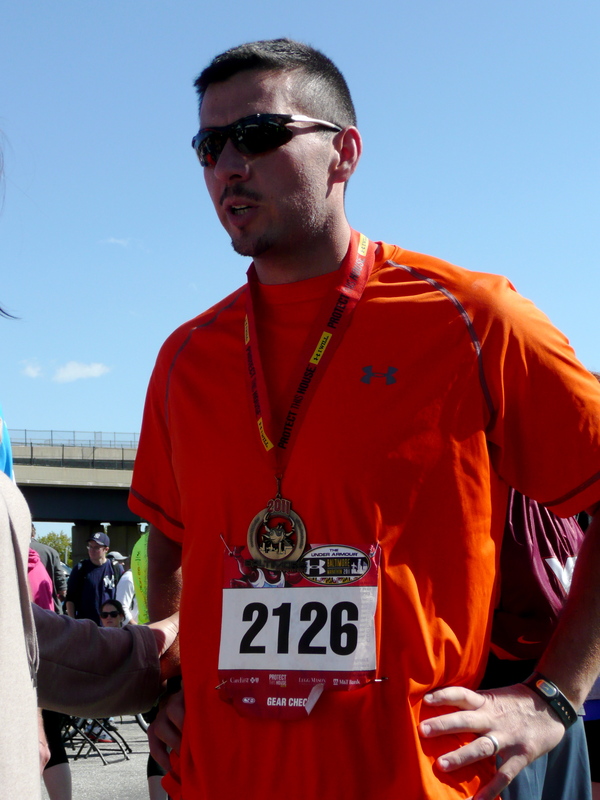 Almost finished.” After that I turned the corner and saw M & T Bank stadium and the finish line. When I crossed I felt so relieved. I bent over and felt my hamstrings tighten up and then I checked my watch. The clock had me at under 4 so I knew I broke 4 hours. To be honest I would have been happy with anything under 4:10. After getting my medal and eating and drinking. I just had to sit down and contemplate what I just did. 26.2 miles. I felt drained a little emotional. I couldn’t wait to see m family but I couldn’t move. I just wanted to sit there and enjoy the sun. When I found Ann and I my family I was still a little shaken but I was so happy. This was one of the best days of my life. They say when you finish your first marathon you have either one of two reactions. Wow, I will never do that again or that was awesome I can’t wait to try it again. I am not ruling out another one. I think this just motivates me to do more. The rest of the weekend we had great meals. I had plenty of drinks and dessert. The next mornings breakfast at Blue Moon Cafe was incredible! I highly recommend the Gingerbread pancakes if you are in Baltimore. The weekend as a whole was a success. I can’t be more proud and I might even take my dog Wrigley on a trail run this weekend to celebrate! Thanks to everyone who helped me along the way. Thanks for all the facebook messages and comments. Of course thanks to my wife Ann who the last few months have been planned around my weekend runs. Baltimore Marathon. Mission accomplished 3:57.04. I still am mad about that one 12:38 mile though! Ann wishes me luck as I leave for my spot in the masses. After the race I wore my medal proud. This is the free Under Armor long sleeve shirt given to all marathon runners. Ann, Krissy, and I talking about the day's events. Take a look at this video. Todd Durkin is the trainer who works with the Green Bay Packer’s Quarterback Aaron Rodgers. He also works with last year’s Super Bowl winning quarterback Drew Brees. Wow what a resume. In this interview he talks about his basic components when training an NFL quarterback. He mentions having great core strength. Any athlete generates 60% of their power from what we call the core. Think of a fishing pole. Your spine is just like that. When a fish is on the line it can bend the pole to one side or the other. When your muscles are out of balance, your spine is misaligned. All of the muscles that act on the spine need to be even distributed so that your spine is in it’s natural alignment. Each muscle group that makes up your core is a line on the pole. They have to be pulled evenly tight. Todd talks about making sure his athletes are trained symmetrically. If you only did chest exercises without strengthening your lats you will be out of balance. Your shoulders will be pulled forward because the front muscles are tighter than the back ones. Aaron Rodgers uses these principles to get him ready for an NFL season but the average person can use them in their every day lives. Symmetric training and core strength and key factors for everyone who steps foot in a gym. It doesn’t matter if you are an NFL quarterback or an average Joe. This is my new health and fitness blog. I hope you enjoy it and can learn something from it. I want to share my experiences with you. Let me be the test dummy and you can reap the benefits.